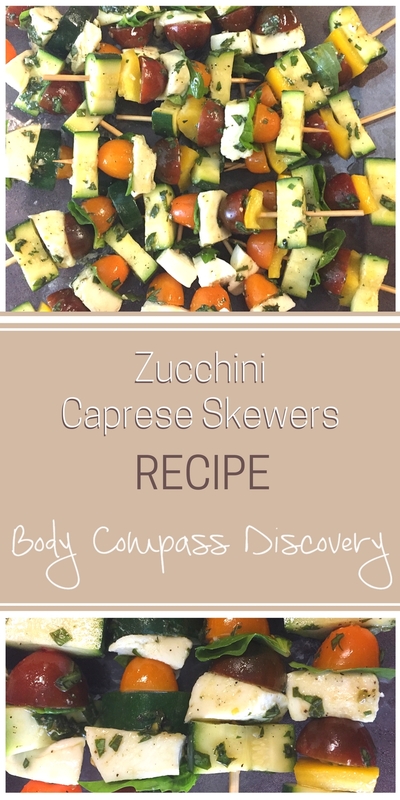 Caprese salad on a stick! Looking for a dish you can put together in a hurry and get on the table during a party? How about one that keeps it light and healthy too? If you love traditional caprese this version of the appetizer may entice you with both color and new taste! We were grilling out for a party we were hosting and my best friend was helping me throw some appetizers together. She and I decided skewers would be a great idea and thanks to her these were invented. 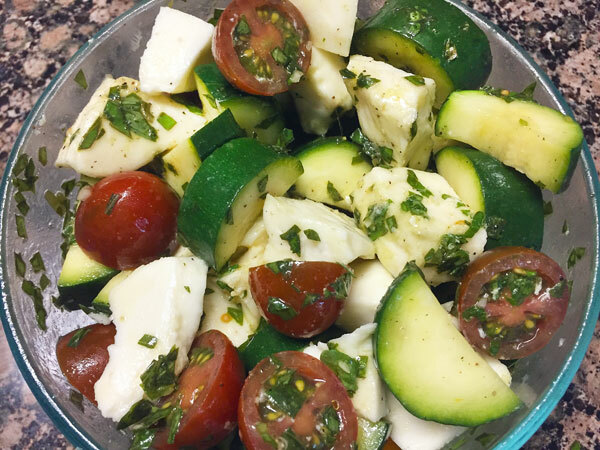 Caprese salad is very popular, and one of my favorites. It happens to be the inspiration behind these! Chop the zucchini and bell peppers, half the tomatoes and cube the mozzarella. For this recipe I chose both orange and red cherry tomatoes, then a yellow bell pepper. Next mince some basil and garlic, then toss it all with oil and vinegar to marinate. I chose to put mine in the fridge for about half an hour or so but this is strictly optional. I go through wooden skewers so quickly, definitely should invest in some of these! 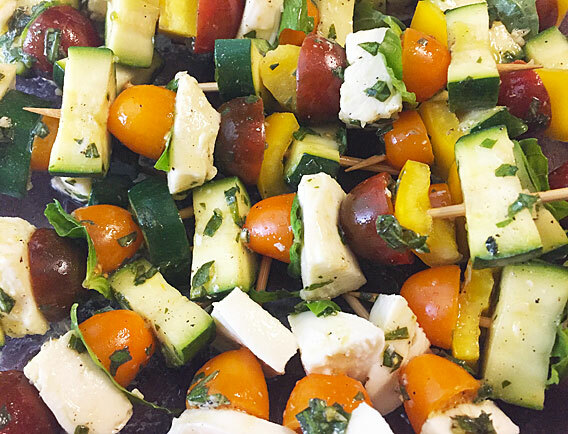 Arrange the veggies and cheese on a skewers. I chose to leave some of the basil leaves whole to add in to the skewers. The best part about this appetizer? No cooking needed- just serve! 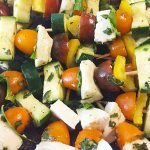 Fresh mozzarella, tomato and basil with zucchini and bell pepper on skewers. 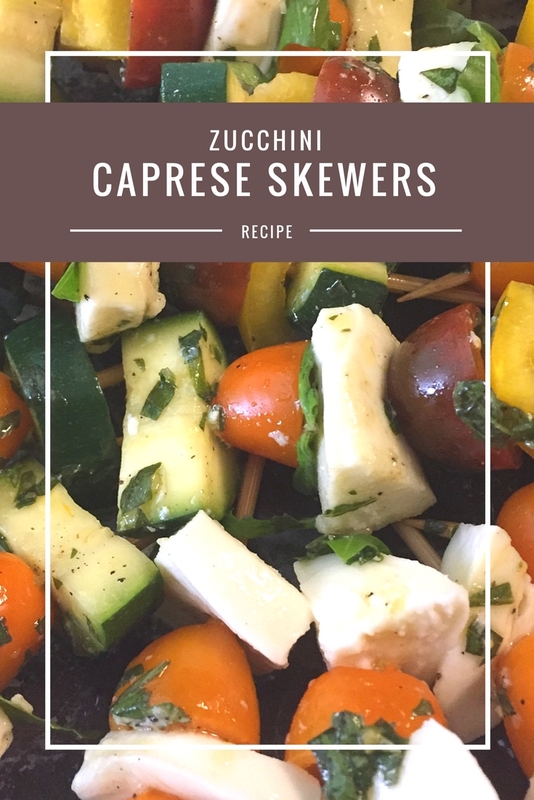 Chop the zucchini and bell peppers, half the tomatoes and cube the mozzarella. Mince the garlic and combine with the oil and vinegar, then sprinkle with a dash of salt and pepper. Drizzle over the veggies in a bowl and place in fridge. Marinate everything in the fridge for about 45 minutes. Once soaked nicely arrange the veggies and fresh basil leaves on skewers and serve! This no bake appetizer is quick and easy. All you have to do is chop up the veggies, marinate and skewer them and you are all set! This recipe looks refreshing and yummy for a hot summer day. Love that it requires no cooking. Thanks, Barbara! They were delicious and a big hit at our gathering! What a great idea! While I love kebobs, I’m not always in the mood for meat. It’s a nice twist on it. Yes- keeps it lighter, but still fun! These look so good! I’m going to to need to try them!